A beautifully presented three bedroom semi detached property featuring an outstanding sun room extension to the rear elevation creating a versatile reception space. The property is ideally suited to the young family or first time buyers and is located within close proximity to local amenities and is within walking distance of Penistone town centre. It currently benefits from off street parking, gas central heating and high specification fitted kitchen and bathroom. ENTRANCE HALLWAY A upvc double glazed entrance door opens into a reception hallway having a staircase elevating to the first floor landing, a radiator and access given to the formal lounge. FORMAL LOUNGE 13' 1" x 12' 1" (3.99m x 3.68m) A front facing formal reception room having a large double glazed bay style window providing natural light within. There is a beautiful ornate fireplace with a multi fuel burning stove set within and a oak plinth mantelpiece. There is decorative coving , a radiator and double internal French doors give access into the open plan dining kitchen. 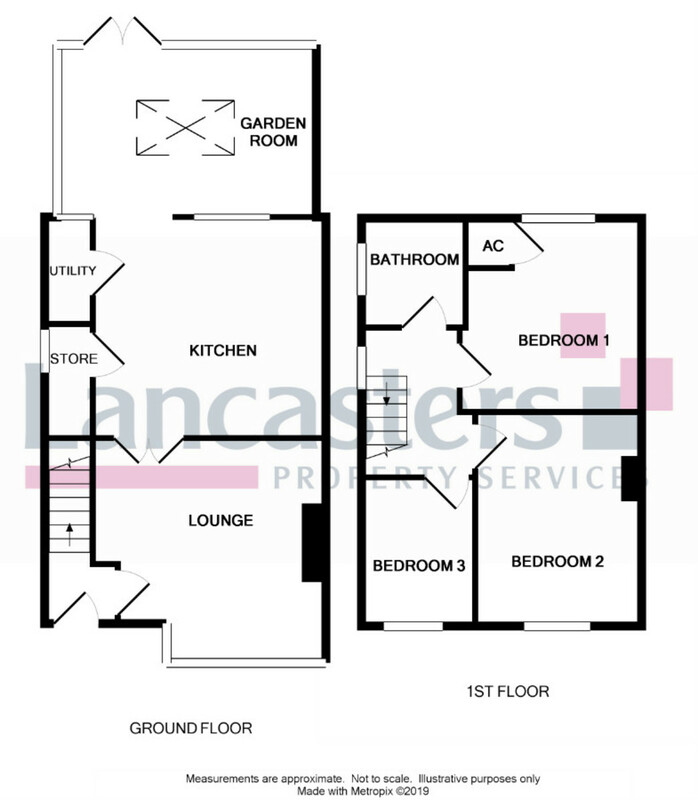 DINING KITCHEN 13' 5" x 12' 10" (4.09m x 3.91m) A beautiful presented kitchen to the rear elevation featuring a high specification kitchen with wall and base units incorporating a pot sink unit with a mixer tap over. There is an integrated double oven, a four ring gas hob, an extractor hood, a space for a freestanding fridge freezer and a central island unit with an overhanging seating area for two persons with electric and lighting within. There is inset spotlighting to the ceiling, decorative coving, a laminate finish to the floor and an open archway giving access to the sun room. Off the kitchen is a useful under stairs pantry style storage cupboard and a utility room. UTILITY ROOM The utility room comprises of plumbing for an automatic washing machine and dishwasher and a space for a tumble dryer. There is a vinyl finish to the floor and a double glazed window provides light within. SUN ROOM 14' 9" x 9' 8" (4.5m x 2.95m) An outstanding room presented to the rear elevation creating this versatile reception area having a vaulted ceiling with light dome and with central doors giving access onto the rear elevation. there is a laminate finish to the floor with underfloor heating, double glazed windows and inset LED lighting. STAIRS AND LANDING A staircase elevates to the first floor landing giving access to Bedroom One, two, three, house bathroom and attic loft space via hatch which is partially boarded for storage. There is a frosted double glazed window on the landing area. BEDROOM ONE 11' 0" x 11' 0" (3.35m x 3.35m) A rear facing double room have a double glazed window, a radiator, a fitted airing cupboard housing a recently fitted Valliant combination boiler. BEDROOM TWO 10' 2" x 12' 0" (3.1m x 3.66m) A front facing double room with a double glazed window, a radiator and decorative coving. BEDROOM THREE 8' 9" x 6' 1" (2.67m x 1.85m) A front facing room with a double glazed window and a radiator. HOUSE BATHROOM Features a three piece bathroom suite comprising of a low flush W.C.,a wash hand basin housing a vanity unit, a panel bath with plumbed in power shower over. There is a vinyl finish to the floor, a heated ladder rail, full tiled walls, an extractor fan and a frosted double glazed window. EXTERNALLY Approached to the front elevation onto a driveway providing off street parking for two vehicles there is also access to the front, side and rear. To the rear of the property is a fully landscaped rear garden being fully fenced and hedge enclosed comprising of an elevated Indian stone seating area with central paved pathway leading onto a separate paved area. There are lawn grass gardens with decorative shrub and flower borders and a platform for a Wendy house and a garden shed. These details were prepared from an inspection of the property and information provided by the vendor on 5th April 2019.